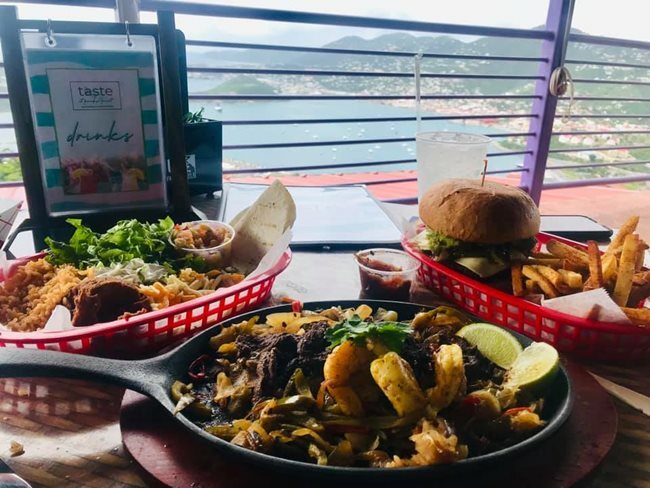 Sitting high above the capital city of Charlotte Amalie, Taste has the best and longest restaurant view in the US Virgin Islands. It’s a short gondola ride up from where cruise ships dock, part of Paradise Point, a mountaintop mall. 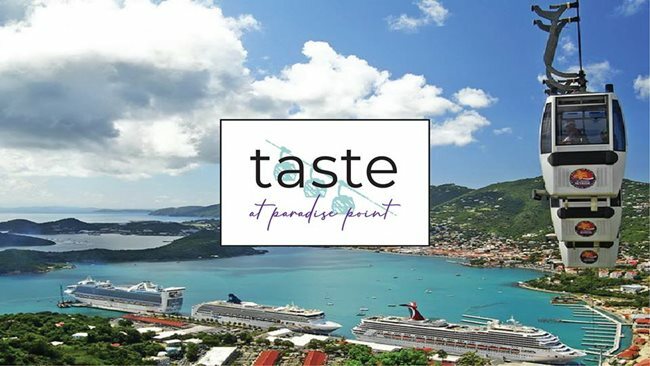 Taste is an open-air restaurant with a wide fully outdoor patio, where they are building a skywalk, where you can walk out and over the long view of the city, the ocean, the cruise ships in dock, and the mountains and islands beyond. Taste is a pub restaurant, with plenty of drinks and a plain decor. It’s an array of outdoor tables without any artwork or signature twist, with basic outdoor tables that seemed small to sit four people and a tray of condiments. You’ll get just plastic utensils, with some meals served on parchment paper in baskets. But the food is uplifting, and it is a unique getaway. 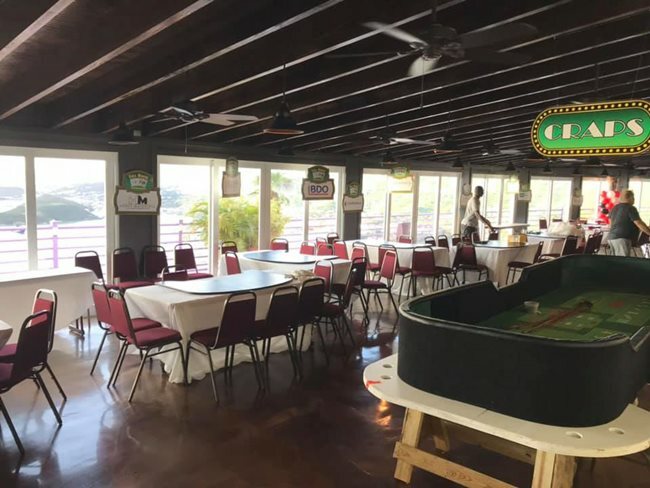 You are so close by and convenient to Charlotte Amalie, but yet separated and high above, the perfect way to “get out of the city” while still being in the city with limited travel time. Pro tip: Taste is popular, but you can choose your own seat, so choose one under shade or take one on the patio, far from the hubbub for a private moment, where you’ll need sunglasses. We sat in the shade of a planter with a small palm tree. The menu at Taste is all comfort food. For an appetizer, try a salad, the Baja Eggrolls, Pickles in Paradise, Texan Fries, or Queso Blanco, a cheese dip with salsa and tortilla chips. You can get tacos with fish or carnitas, Cubano Carnitas, which is pulled pork quesadillas with mustard and bacon, and Rastadilla, which is a vegetarian quesadilla with mushrooms, roasted peppers, avocado, and more. They’ll serve an entire pitcher of water on request, and we tried a mango smoothie. It was deliciously cold for a hot day, smooth, and they haven’t added syrup to it, so it’s not sicky sweet. The passion fruit smoothie with slash banana was tarter and fruitier, and came with a lemon wedge. We ordered the Nachos with beef barbacoa, which came out quickly. The beef was excellent, not fatty at all, a pulled beef with a rich, meaty taste. The portion was small but delicious, coming with jalapenos, a cheddar cheese, and an avocado cream sauce. These nachos were modest in size but tasty, and the lettuce was fresh and crispy, rather than the wilted lettuce one expects on nachos and hamburgers. It was served on paper in a basket. We did rip the paper trying to get the nachos and the cheese up. The Smokehouse Ribs were also good. The meat just fell right off the bone. They should have come with additional napkins or hand wipes, and we could have used some more sauce. The rice and beans were ordinary, and we did not finish them. We also got the fajitas for two, a steak and shrimp combination that were hearty but typical. You’ll find beef and shrimp served on a hot skillet with grilled peppers and onions, lime wedges, with dirty rice, refried beans, wonderfully crisp lettuce, sour cream, and cheese. Service was good at Taste. Our server was attentive, answered our questions creatively, and our appetizers and meals came quickly, although it took a while for dessert to come. We also tried the Churros, which was our favorite dish at Taste. They are fried sticks of dough with cinnamon, drizzled with honey, served warm with ice cream on the side, so that they don’t interfere with each other and you needn’t race to eat it before the ice cream melts. The cinnamon ice cream was a tasty and creative touch! We also liked that the sugar was light enough so that it did not hide the taste of the dough. This dish was a great combination of tastes. Or try the funnel cake, with cake on the bottom layer, and ice cream on top, with drizzled chocolate sauce. Although the cake was basic, and too heavily fried to be tasted, it came with that same delicious cinnamon ice cream, sprinkled with powdered sugar. Taste does not have a distinguished restaurant menu, and the baskets and plastic cups make it an average rather than exceptional restaurant. However, the views are the best on the island. So we’ll give 4.5 stars for Taste. After the hurricane in 2017, Paradise Point is going through a rebuilding phase. Soon they’ll have added a breathtaking skywalk, a private events space, and a new steakhouse restaurant to be called Prime. 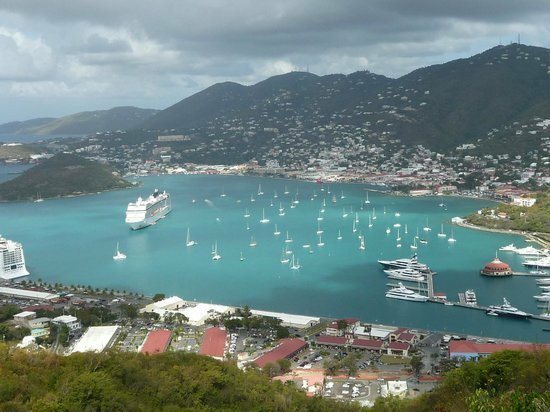 If you have just a few hours off the cruise ship to experience St. Thomas, Taste is the best perch to take it all in. See Taste Restaurant on Facebook, and read our review of the Skyride, the gondola to Paradise Point.